The 10th annual Pinball Life Explosion was something we all wanted to be special. Many people pitched in and did many things. The show was nothing less than spectacular. One of the many people pitching in was Yancy Blaylock. 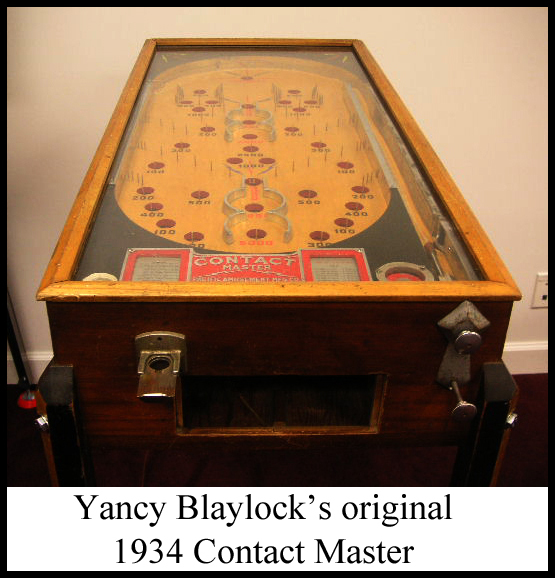 He brought his 1933 Contact Master pin game to be enjoyed in our newly minted VIP lounge. After the Explosion was over the game still lingered there. I didn’t have to walk past Contact Master too many times to make the rash decision to manufacture a *modern* version of this game. The century was already 14 years old and it was begging for it’s first new production pin game. There were some problems with this idea, not the least being that no one has paid much attention to pin games for 75 years. Pinball hobbyists tend to love 21st century pinball and 90’s Williams/Bally pinball. They like 80’s pinball and find 70’s pinball interesting on certain levels. To be into 60’s pinball usually means you are at least 55 years old or you have been in the hobby for 10+ years. To be into 50’s woodrail pinball machines requires a good health plan, as living long enough to yearn for these machines takes some doing. 40’s flipperless pinball? It’s not for your pinball hobbyist commoner, that’s for sure. Before all of this came pin games (later referred to as bagatelle). Technically it is flipperless pinball, but its simple ideas predate them and a purist can easily site the differences between said machines. A bigger issue than the pure lack of interest in pin games was my lack of possessing any sort of true skill. Making this machine would require the kindness of others. This would find me falling back on my reliable sources; Andrew Barney of APB Enterprises (production manager, design, coil winding, and laser etching/cutting), Dino Naber of Kinney Electric (metal fabrication), Scott Danesi of Danesi Designs (sound, music, and design), Mike Szewczyk of DK Pinball (custom boards), Paul Maletich of VirtuaPin (cabinet and playfield construction), Charlie Emery of Spooky Pinball (playfield and translite printing), Kevin Dabrowski of PDM (packaging), Doug Manley of Trilogy Brewing (custom PinGulps), and Joe Kase of Laseriffic (laser cutting and lighting), It would also find me diverting the time and energy of a couple of our employees; Alex Hanna (SolidWorks design and 3D printing) and Jose Mesa (woodworking).